Autism, a brain disorder with apparent genetic links, was exhibited in as many as one in 150 American children born in 2007, according to the Centers for Disease Control. While some autistics appear almost nondisabled, many others perform compulsive behaviors, are unable to interpret basic social cues, and react defensively to touch. 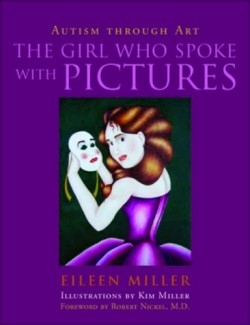 Writer Eileen Miller chronicles the emotional and cognitive development of her daughter Kim from birth through her late teens. Kim, now in college, learned to use art as a vehicle through which she could communicate her perceptions of the outside world. From her first childish lines and circles to the masterful drawings and sculptures she created as a young adult, Kim’s art helped to unleash the emotions and dreams of a person unable to express herself in the ways most people take for granted. The writer’s authority on autism does not come from professional training but from her experience parenting an autistic child and collaboration with professional educators, medical specialists, and even helpful neighbors. By meticulously journaling about her daughter’s progress and saving selected artwork, she reconstructs her journey of life with this enigmatic and talented girl. Commentary provides context for the frustrated scribbling of Kim’s preschool years as well as the thoughtful and sometimes disturbing images of her life as an autistic high school student. The combination of art and commentary gives the reader an unprecedented glimpse into the complex and intense world of the developing autistic mind. Because the writer chooses to sort the text into themes, which include emotions, perception, and advocacy, the book can seem disjointed as preschool drawings are paired with those produced later. A purely chronological treatment of Kim’s progress may have made it easier for readers to follow along. Still, the writer does much to inspire advocacy for this poorly understood brain disorder. Anyone fascinated by child development, brain science, or outsider art should appreciate this brave mother—daughter collaboration.